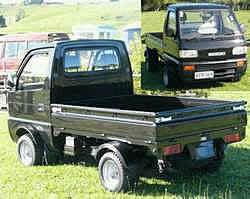 Home / category "Japanese Mini Cars"
These trucks are legal in Canada and can be driven on any road. Excellent stability in uneven terrain. Super fuel economy. 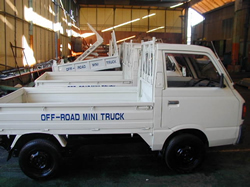 Japanese Mini Trucks are built by the company’s most famous for reliability (Honda, Mitsubishi, Subaru, Daihatsu, Suzuki) and they bring that same passion for engineering and reliability to the Japanese Mini Truck. Where do ATV Trucks come from? They are all imported directly from Japan. What are these vehicles used for in Japan ? Mainly used as an On Road Vehicle. 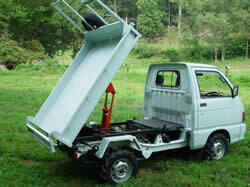 There main use is for moving goods due to the narrow access ways near rice paddies and in the cities crowded streets. What do you do to these vehicles once they arrive in Canada? 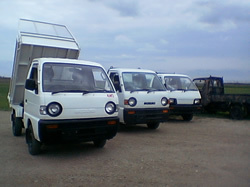 These are second hand vehicles, so they are serviced and completely safety checked. Like all automotive vehicles oil change is the most important. We also check the cooling system, differentials, transmission and transfer case. 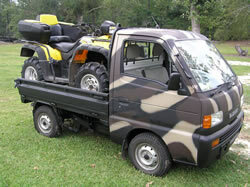 Yes, we get descriptions and pictures of the vehicles before ordering. So, we know the mileage before they are ordered. Are parts available for these vehicles? Yes. All Makes that we import have Auto Dealers nation wide in the United States. What makes do you have available? 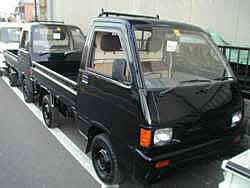 Japanese Mini Truck makes are Daihatsu Hijet, Suzuki Carry, Mitsubishi Minicab, Subaru and Honda. Are there different trucks available? Yes, the different makes we offer come in 4 spd, 5 spd, or auto transmission. 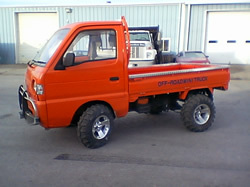 Trucks are available with standard tires or optional ATV flotation tires. We can custom Fab anything you would like. 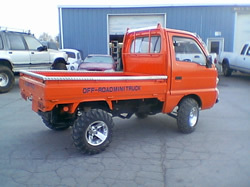 Japanese Mini Truck will get you to most places an ATV will go. These trucks Extremely fuel efficient and reliable you will get much more use out of our trucks then you will an ATV and have fun doing it.